IP Vs. Analogue Security Cameras | Calgary Alarm Inc.
Crime is on the rise in Calgary. In 2016, the level of crime increased by nearly 30 per cent. Statistics Canada’s Crime Severity Index now puts Calgary at the highest level of crime since nearly a decade ago. Now is the time to invest in security for your home and your commercial business. Studies have shown that both alarm security systems and 24-hour monitoring systems deter criminals and these safety benefits also extend to security cameras. If you are on the market for a security camera, you have likely noticed two primary types, IP and analogue. Here is a breakdown of how these two security cameras differ. 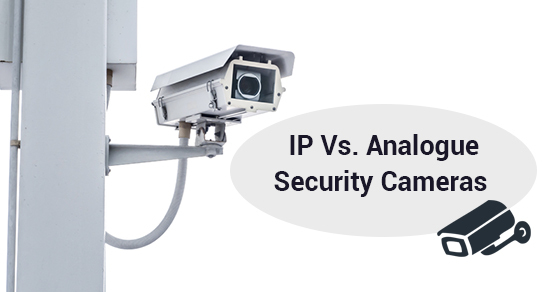 The difference between IP and analogue security cameras primarily comes down to what it does with the video footage. IP, which stands for Internet Protocol, sends the footage via a computer network while an analogue security system sends the feed to a DVR (digital video recorder). Other than this, there aren’t too many differences. In short, IP security cameras are the more modern technology, but both have benefits. IP security cameras result in better picture quality and can also capture more in view. IP cameras also have the ability to identify certain things that you want them to (this is called video analytics), whether it is motion or someone who is handling the camera in some way. In addition, you can set up several different cameras very easily. This is because each IP security camera has its own IP address that connects with the main hub or computer, which is called the network video recorder (NVR). In this way, the IP security cameras have a lot of scalability potential. Another benefit of IP security cameras is that they are very easy to install. When it comes to analogue systems, however, while they also have a network video recorder, coaxial cables are involved, meaning that more labour will be involved. You will also be limited in terms of the number of cameras you can have. That said, they will not experience network disruptions like IP security cameras can. Whatever security camera you choose, the important part is having video surveillance in place. As one of the best security alarm monitoring companies in Canada, consider Calgary Alarm for your choice of video surveillance. Contact us today for more info. We are committed to keeping you safe.